To carry this one step further what we’ve done is superimposed fluxes from Tesla transformers in bulbs filled with gaseous media … and: When you do this you find that you actually start to get galactic formations and what appears to be outlines of marine organisms all with the most stunning color. And this connects directly to Reich’s Cosmic Superimpostion Theory where, if you take; two primary energy fluxes and converge them in a space these longitudinal – not scalar – but longitudinal fluxes will start to form a spiral formation which grabs up the energy and these spirals are again all based on these log periodic form. if you take; two primary energy fluxes and converge them in a space these longitudinal – not scalar – but longitudinal fluxes will start to form a spiral formation which grabs up the energy and these spirals are again all based on these log periodic form. how does plasma behave in a glass "cube" as opposed to a sphere? kiwi wrote: I thought longitudinal=scalar? Scalar has no period, no wavelength, is therefore not a wave. Longitudinal waves have these things, and are waves. EG: sound in a room, air pressure is the scalar component, soundwave is the longitudinal component. It's a common nomenclature issue, i'm with Dollard on that one, it's stupid. kiwi wrote: how does plasma behave in a glass "cube" as opposed to a sphere? Could that object have been a plasmoid? The concept of scaling would seem to apply to plasmoids also. The odd shape similar to Egyptian royal headdress may be due to atmospheric pressures/interactions or more likely due to shifting electrical pressures during the storm. Here's a cool technique to try with online videos such as the Lightning Slowed Down 300x. Click the play-pause button in rapid succession as fast as you can and you'll see even more details! Did lightning cause the crash of AF447? 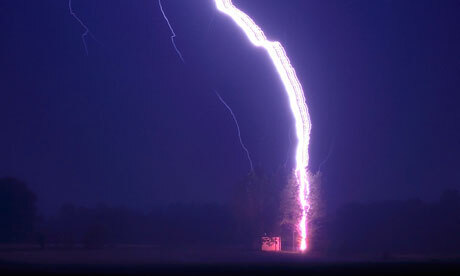 Article: Do cosmic rays cause lightning? * I don't know if I should have put this in the Electric Weather, or Electric Clouds, thread, or what, so I decided to start a new thread. - Ribbon lightning occurs when the bolt consists of several parallel strokes, making it look like a ribbon. - The photographer said that the lightning in his image has 10 distinct strokes. Five are easily visible but the rest require very close examination. * I was glad to find that explanation of the ribbon-like formation, but now I'm wondering what would cause parallel streamers to remain flat, side-by-side, rather than braid around each other, as in normal Birkeland currents. It would seem to me, that this is most likely the result of the plasma column being moved over time by the wind. The repeated strokes follow the same (moving) column, which remains partially ionized for a time after each separate stroke, guiding the next stroke to follow it, etc. Two things [are needed] - multiple strokes, and a strong lateral wind. Each successive stroke follows a wind-displaced hot channel that hasn't fully cooled down from the previous stroke. The sequence of successive strokes form a ribbon of similarly-shaped discharges. * I don't claim to understand that in detail, so, if anyone can clarify further, it would be helpful. The lightning path creation from cloud to ground [or vice-versa] is instantaneous [the path of least resistance is prescribed by the atmospheric/charge conditions], so the lateral wind issue is the key in lightning sheet production. The diferential heating [and resultant lighting] of the air by the electric discharge leads to the perception of a "stream" of electricity in timelapse lightning shots. Most lightning doesn't occur as just a single pulse of current. Rather, once the main discharge channel has been established, the actual visible bolt of lightning is generally observed to proceed as a series of pulses in rapid succession, over a course of many tens of milliseconds. After each pulse, the discharge channel remains partially ionized (and therefore conductive) for a period of time, so the next pulse largely just follows the same route, as does the one after that, etc. So the main discharge channel is illuminated many times in quick succession. If at the same time the wind is moving the discharge channel sideways (after all it's a column of plasma, and can be blown by the wind), then each successive pulse will be displaced a little from the position of the one that just preceded it. If you have a camera with the shutter open taking a picture during this, then it records all of these successive strokes into the same image, so it ends up looking like a ribbon.